Pio Duran is a small town and a port in the southern coast of Albay. However, some people spell this as “Pioduran” which is incorrect since the town was named after the Congressman who sponsored the bill creating the town. The town was eventually created after Congressman Pio Duran died. In the past this place was called “Malacbalac” and it was known for mainly one thing, its abundant fish which was supplied to the rest of Albay towns and even as far as Iriga in Camarines Sur. Before that the place was generally referred to as “Panganiran” and thus the bay where Malacbalac is situated is called Panganiran Bay. There is still a barrio named Panganiran in Pio Duran town. For decades after the creation of the town, Pio Duran was not an enchanting place to visit because of the really bad state of the road then (it was unpaved and muddy) which was sometimes cut at the peak of the rainy season or when there is a typhoon. In 1984 a new port was built in the town supplanting the old wooden municipal port. This was one of the 12 Bicol ports wangled by then Minister Luis Villafuerte from President Ferdinand Marcos when there was already an arrangement that Villafuerte’s ministry will be absorbed by Roberto Ongpin’s ministry. The funds for the ports were sourced from JICA (Japan International Cooperation Agency) and these were called “fishports”. But except for Camaligan port, it cannot be compared to the known fishports today like Navotas, Daliao and Sangali because it is just a port and there are no blast-freezing facilities, cold storage and fish processing. 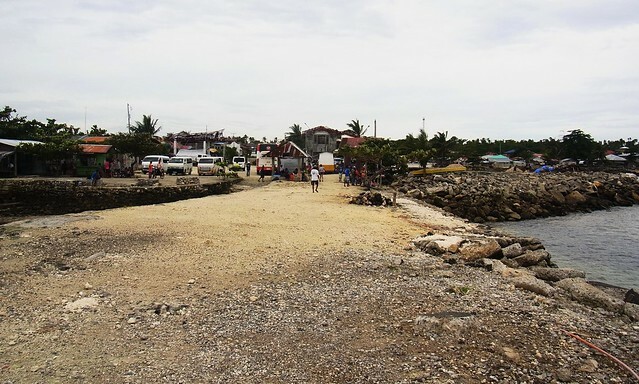 After more than 20 years, the old municipal port and “fishport” of Pio Duran were practically gone, weathered by the elements and assaulted by the storm waves generated by the typhoons that pass Bicol and the sometime fierce habagat waves. That is why when President Gloria Arroyo thought of Pio Duran as a RORO port a new, very simple finger port with no back-up area has to be built. Pio Duran “fishport” is one damning evidence against politicians and bureaucrats who say that when a port is built the ships will come. Usually when the ships try to come many years later the old port is no more. Ports are unlike highways or roads than when built then people and vehicles come. I really don’t know why we have to listen to politicians and bureaucrats who have no knowledge of maritime matters like the former Senator Aquilino Pimentel Jr. Even when the new port was built it did not have ships coming immediately. What turned the table in favor of Pio Duran was the bad situation in the nearby port of Pilar in Sorsogon which connects Masbate to the Luzon mainland through ROROs and other kinds of crafts. New players wanted to come in but there were two obstacles. One, the old port of Pilar was only serviceable because the pioneer RORO operator Montenegro Shipping Lines Inc. made improvements. There were no improvements before because President Arroyo hated the guts of the Congressman then of the place which was Francis Escudero who among other congressmen tried to file an impeachment complaint against her. Now, one can’t do that to a Capampangan without reaping the whirlwind. Pilar port at the start did not even have a RORO ramp and besides the docking area is crowded because it is actually small and there are a lot of passenger-cargo motor bancas and some motor boats. The second obstacle was being in a river estuary Pilar port is very shallow and only basic, short-distance ferry-ROROs and LCTs can dock there. In an oncoming low tide, the RORO has to leave early otherwise it might not be able to get out. One competitor of the Montenegro Lines does not even have basic, short-distance ferry-ROROs so Pilar port was automatically out for them. It was the expanding Medallion Transport which first applied for a Pio Duran-Masbate route. Next followed the dominant shipping line of Bicol, the Sta. Clara Shipping Corp./Penafrancia Shipping Corp. combine which then ditched their unprofitable Bulan-Masbate route (before that they even tried a Pasacao-Masbate route which they abandoned very fast). The RORO business between the Bicol mainland and Masbate bloomed and many buses and intermodal trucks now cross daily and some are even destined for Cebu through Bogo port. Cebu trader trucks now also cross to the Bicol mainland through Masbate. There are also vehicles destined for CALABARZON and Metro Manila. There is now an even split between Pio Duran and Pilar in terms of RORO traffic. The Sta. Clara Shipping Corp./Penafrancia Shipping Corp. combine and Medallion Transport operate ferries to Pio Duran while Montenegro Lines operates ROROs and fastcrafts to Pilar and Denica Lines also operates ROROs and motor bancas to Pilar. Recently, I noticed Montenegro Lines got a franchise to Pio Duran. 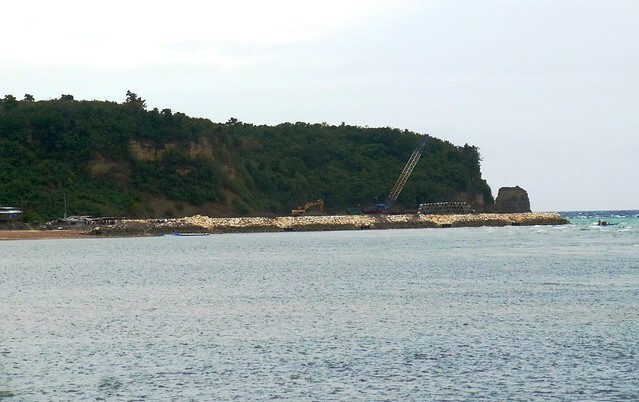 Well, with the construction of a back-up area and a new RORO ramp more vessels can now be accommodated in Pio Duran. Pilar is also improved now and I wonder if the Sta. 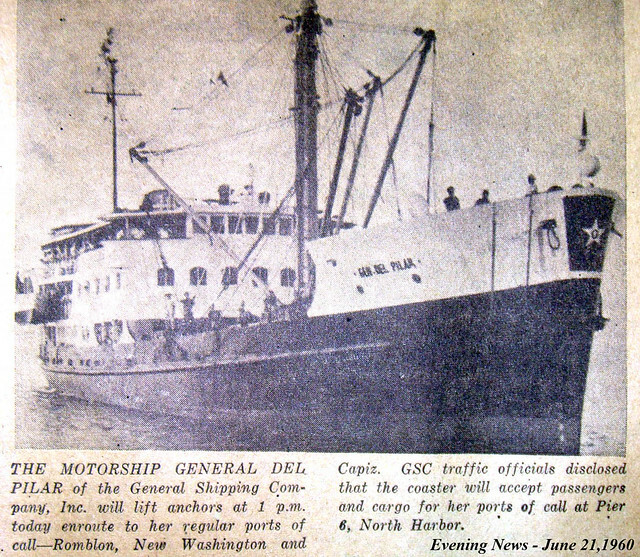 Clara Shipping Corp./Penafrancia Shipping Corp. combine will “invade” that. Maybe not if the port is not dredged (there had been long calls for this but the government practically have no more dredgers running). For intermodal buses and trucks coming from Manila and CALABARZON and even Naga, Pio Duran has an advantage in that about 40 kilometers and more than an hour of travel time is shaved. Besides, Pio Duran has no depth problems and so docking and undocking can be done at any time unlike in Pilar. Pilar meanwhile will always host the motor bancas and the motor boats because those connect local passengers and cargo to Masbate. A passenger or a shipment from Daraga, Legazpi or Tabaco will not use Pio Duran because it will then be a longer route and besides there are no motor bancas or motor boats running from Pio Duran to Masbate. This situation is also true for the fastcrafts where the passengers are mainly local. Meanwhile, Pio Duran will continue to host the few motor boats going to the Claveria town in the eastern half of Burias island. Whatever, it can be said that Pio Duran town and port has already triumphed. 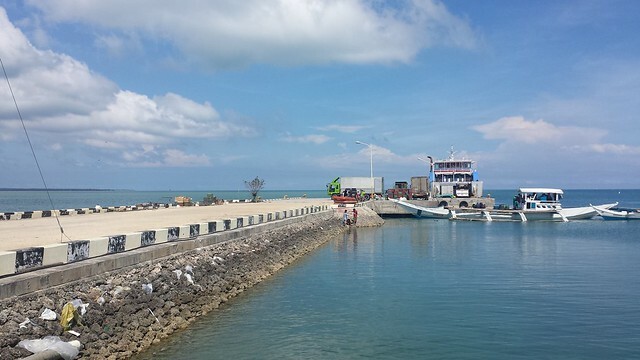 From a sleepy, remote town with no ROROs and not many buses and trucks, it is now beginning to bustle with activity because it became a connecting port to Masbate and part of the intermodal system of transport and an alternative to Pilar. Pio Duran port is no longer a port to nowhere. Unlike one near port to the west of them, the Pantao port which is the white elephant of Governor/Congressman Joey Salceda and it is still a port to nowhere until now. If only the funds spent for Pantao port to be a “regional port” were given to Pio Duran and Pilar ports. Well, that is how politics and development intertwine in the Philippines. Twenty years ago, the port of Masbate was mainly known for the so-many motor bancas (and a few motor boats) that ply routes to Pilar, Sorsogon, to Ticao Island and to the western portion of Masbate Bay up to the town of Baleno, Masbate. The only liners from Manila that call then in the port were the MV Cebu Princess of Sulpicio Lines and a liner of WG&A Philippines. Surprisingly, they were not the RORO connection of Masbate Island and neither is the overnight ferry from Cebu of Trans-Asia Shipping Lines. Actually, the RORO connection of the Masbate then was the unlikely ferry of Viva Shipping Lines that originates from Batangas Port. Pilar then was the main connecting port to Masbate. Buses from the semi-regional trade center of Daraga, Albay roll to Pilar. Then, there are many buses from Manila whose end point is Pilar. The motor bancas that ply the Pilar-Masbate route usually have already an arrangement with the buses. Motor banca tickets can even be issued aboard the buses in many cases. In the reverse route from Masbate, aboard the motor bancas, bus tickets can also be issued. But for those who are experienced enough, they won’t buy those tickets and instead look for discounts in the buses to Manila waiting in Pilar. They know that the buses with only a few passengers are vulnerable to these discounting tactics. Pilar-Masbate motor bancas also take in a lot of cargo either way when there were no ROROs yet (actually, they still do today but on a comparatively smaller scale). One advantage offered by these motor bancas is there is no porterage. The crew takes care of the cargo and one just goes direct aboard and the purser will take care of charging the fare so there is no need to queue for tickets. Two motor boat companies dominated this trade here, the Denica Lines and the Lobrigo Lines. Though not comfortable, their motor bancas are fast. There were also a few cargo ships that called on Masbate Port aside from a few cargo motor boats. One regular incoming bulk cargo is cement and one regular outgoing bulk cargo is copra. 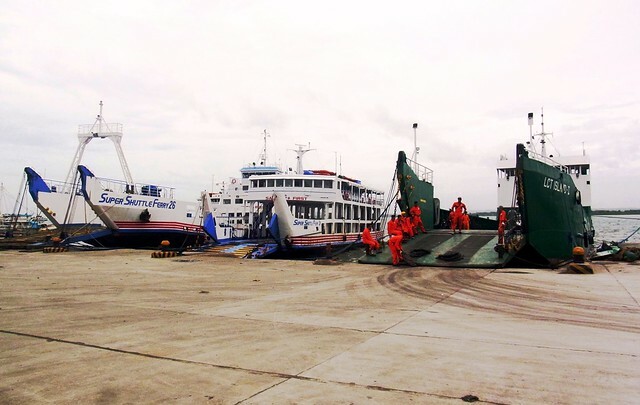 Archipelago Ferries (actually it could be another of their legal fiction companies) attempted the first short-distance ferry connection to Masbate through the MV Maharlika Tres. They used the Bulan Port since at the time the Pilar Port was not RORO-capable. With it also came the Philtranco buses rolling to Masbate. However these ferry and bus services did not last long. One problem is without RORO company support, the buses won’t last long because it was upheld by the maritime regulators that they cannot charge the RORO rate to the passengers (although some try to charge that on the passengers part of that, slyly). And without a good number of vehicles regularly boarding, the ferry companies would be hard put to give discounts. Viva Shipping Lines and then its new competitor Montenegro Shipping Lines also tried a RORO connection from Lucena to Masbate. Parallel with this, the twin company of Viva, the DR Shipping Lines tried a fast ferry service from Lucena to Masbate using their own-designed and built ships, the MV Penafrancia 10 and MV Penafrancia 11. These services stopped after a few short years for different reasons. For Montenegro Lines, their RORO MV Maria Carmela burned in 2002 just before reaching Lucena, with casualties. Its local government authorization was canceled and they were embroiled in lawsuits. For Viva Shipping and DR Shipping, it was already the beginning of the tailspin of the Don Domingo Reyes shipping companies which ended with them defunct and their ferries sold or broken up. Montenegro Lines then built their own ramp in Pilar and they were able to operate a basic, short-distance ferry-RORO from it. They have to do it themselves because the administration then of Gloria Macapagal Arroyo wouldn’t provide funds for the construction of a RORO port because the Representative then of the congressional district encompassing Pilar was a bitter political opponent (he is now a vice-presidential candidate). Lobrigo Lines tried to operate two fastcrafts between Pilar and Masbate. Montenegro Lines also did so. Lobrigo Lines later quit and their fastcrafts ended up with Montenegro Lines. Later, this route became the niche of Montenegro fastcrafts driven out by superior competition in the Batangas-Calapan route (until now they are the only operator of High Speed Crafts in the route). Sta. Clara Shipping with twin company Penafrancia Shipping tried to enter Masbate through different routes. They tried a Bulan-Masbate route (their ships are not fit for the shallow Pilar Port which is located in a river estuary) but the bus passengers from Manila were not willing to pay extra for the longer Manila-Bulan land route. They also tried a Pasacao-Masbate route but they found out early that the strong habagat swells were dangerous for their ship. Finally, they found the Pio Duran, Albay Port with its new RORO ramp as the Masbate connection and they stuck here along with newcomer Medallion Transport. From Cebu, another player also entered the Masbate route, the MV Super Shuttle Ferry 3 of Asian Marine Transport Corporation and this ship continues its voyage to Batangas. Trans-Asia Shipping Lines continued plying its route until recently. However, a shortage of ferries forced them to stop but they replaced the service with a former ferry that was converted into a cargo ship, the MV Trans-Asia 5. The cargo was simply too big and too important for them to lose to competition. Cokaliong Shipping Lines is the new entrant from Cebu lately using a ferry. The Sulpicio and WG&A liners are gone now for different reasons but they have been more than replaced. Actually, they might not even be missed in Masbate. Nowadays, Masbate is already a busy port and growing in importance because it is already the fulcrum of a growing intermodal route between Cebu and Luzon (that includes the National Capital Region, Bicol and CALABARZON). Many of the trucks loaded in Polambato Port in Bogo, Cebu that are unloaded in Cataingan and Cawayan ports still connect to Luzon (and they have to use Masbate Port on the way to that). Meanwhile, distribution trucks from Manila and CALABARZON now roll direct to Masbate along with the trucks of the Bicol traders (incidentally, some of them used motor boats and motor bancas in the past). Today, fewer and fewer Masbate passengers still take the motor bancas. They now prefer the intermodal buses that come from Manila that roll to the various destinations in Masbate Island like Masbate City, Aroroy, Milagros, Esperanza, Cataingan and Placer. Because of the needs of the buses and trucks, Montenegro Lines now operates several ROROs and so do the twin company Sta. Clara/Penafrancia Shipping (and with even bigger ships) and Medallion Transport. Another new operator from Pilar is Denica Lines which bought their own small ROROs. The fastcrafts are still operating between Pilar and Masbate and the motor bancas did not seem to lessen in number. More cargo ships are also now calling in Masbate Port. The port was expanded a decade ago and now a second phase of expansion is near completion. In Region 5, the Bicol Region, it is clear that Masbate Port is now the busiest port. Good thing it is not yet an ISPS (International System of Port Security) port and so it also functions as a people’s park (and a jogging area in the morning) and anyone can go in and go out. As said by old timers, shipping activity is a accident of geography that cannot be dictated by the maritime authorities nor by legislation. In this sense, Masbate is fortunate because she lies between Luzon and Cebu, the commercial center of Central Visayas, part of Eastern Visayas and of northern Mindanao. As such, her growth as a port will surely continue in the coming years and probably she will be more well-known by then.